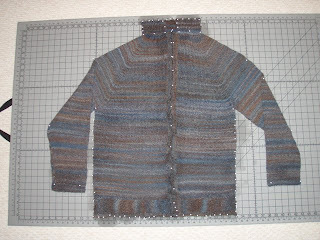 Pinning it out and blocking it to get it all even - it's a beautiful piece - it's just that it doesn't FIT. After finishing Gregg's sweater and put it on him... 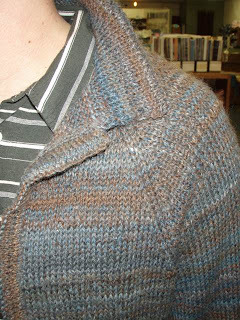 I already knew that things were "odd" with it - the fit was strange - it was too long - seemed too big - the collar was wacky (probably because I had sewn up the two ends different ways!) and the center part was not in the center! I was disappointed - and fruatrated - and in a fit of decision I handed it to Florence (the owner of Bishop's Yarns) and asked her to rip it out for me. 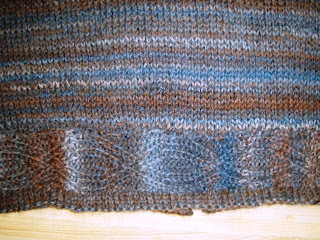 I did a REALLY good job of weaving in all the ends - so it took her a while to get it started. I won't be around for most of the dirty work (I hope) and I don't feel that badly about tearing apart months and months of work - it's just that if it's not right, and doesn't fit well, what's the point of keeping it? 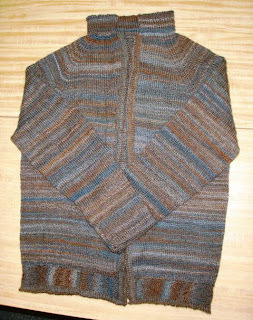 I have found a different pattern to re-use this wonderful yarn - and I asked Gregg to pick a new yarn and pattern for his next sweater. He'll get one - just not this one. He's OK with it - he knows the amount of time involved in making a piece - and he knows I love it (and him) and want it to be right. SO - unravel it shall, and I will try again. I'm OK with this - really. It's all about the process and learning and leaving behind pieces we can be proud of. (Thanks, Brenda (from Cast-On) and Terry (from Bishop's) for making me rip my heart out. The sweater looks wonderful! The colours blended beautifully. 'Tis sad that the sweater didn't fit as you'd been working towards. 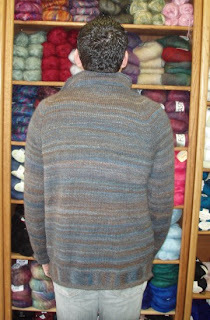 (I know that feeling all too well) Hope your next adventure of knitting a sweater goes as planned.